Political and social unrest has affected El Salvador for many years. The centre of its capital, San Salvador, is an area of historical and cultural significance but has suffered from violence and dereliction. Many of the households living in the historical centre are among the poorest and most socially excluded in the city. Until recently, they lived in very poor conditions, in unsafe buildings and without proper infrastructure. 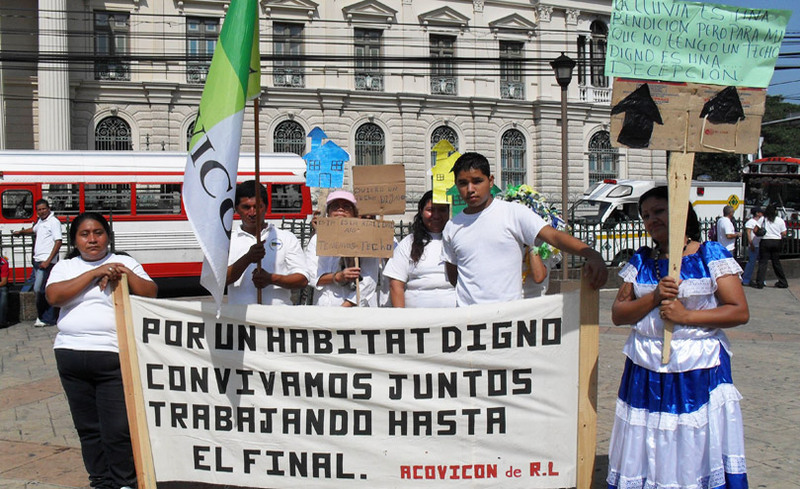 Together with a network of organisations campaigning for housing rights across Latin America, the community has won the right to own and build on the land. Through activism, collaboration and support, poor quality shacks have been replaced with safe, colourful, and permanently affordable homes, owned by the community themselves. The regeneration of San Salvador’s historical centre has provided hope and inspiration and has increased the growth of mutual aid housing cooperatives, where people work together and support each other to provide their own homes. Many historic town and city centres in El Salvador have suffered years of neglect and a lack of investment. Housing within these areas is often in disrepair, lacks basic services and puts residents at risk of eviction and poor health. 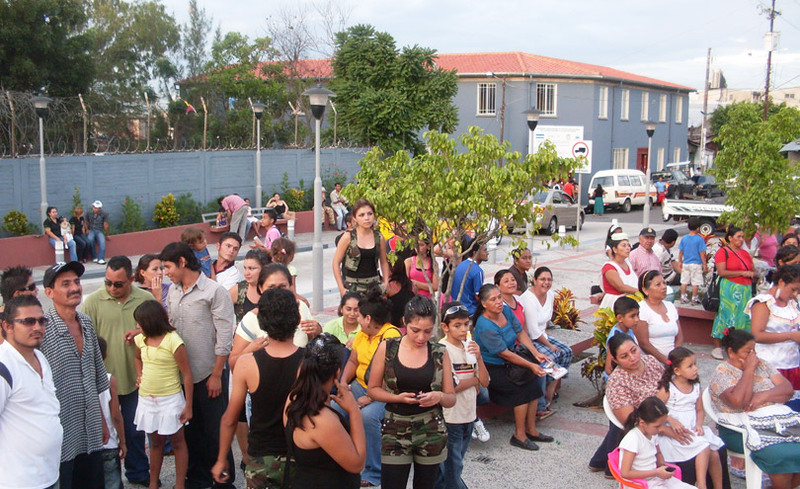 Through a programme of training, funding and collaboration, a network of organisations including FUNDASAL (the Salvadorian foundation for development and adequate housing), FESCOVAM (the Salvadorian federation of mutual aid housing cooperatives) and FUCVAM (the Uruguayan federation of mutual aid housing cooperatives) has worked to help the local community to set up the first five mutual aid housing cooperatives in the city’s historic centre. 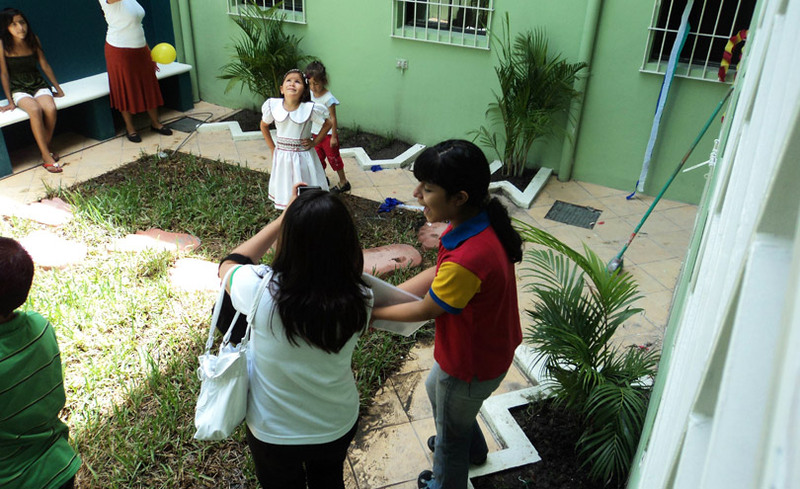 With training and support, the cooperatives of the San Salvador historic centre convinced the Salvadorian Government of the cultural importance of their neighbourhood and of their right to be housed there safely. In 2008, the Salvadorian Government provided one plot of land to the new cooperatives at a nominal price. Two more plots were bought from private landowners. FUNDASAL raised funds to cover technical training to help the residents design and construct their homes. Two of the first five cooperatives, ACOVICHSS and ACOVIVAMSE, replaced and/or renovated run-down buildings in the inner city using designs inspired by its historic features. Instead of using new land, existing buildings were replaced and extended upwards. They designed the new buildings to include shared public spaces and provided areas for commercial activities. The cooperatives built colourful multi-storey blocks, designing them around a central courtyard to maximise natural light and ventilation. This comprehensive programme has revitalised the city centre and has created a sense of pride in the community. (The other three cooperatives are in the process of developing housing projects). By 2013, ACOVICHSS and ACOVIVAMSE had built 61 homes in three blocks, housing 240 people. Seventy per cent of these were women-headed households, often living on very low incomes in informal employment. The work to set up new cooperatives in the historic centre deliberately focused on the most vulnerable households (women, children and young people). Their situation made raising or borrowing money very difficult, but by working together the cooperatives won legal recognition, and secured land from the Government to build and manage their own housing. Affordability is ensured for those living in the new cooperatives, even for those on very low incomes. This is achieved through a combination of mutual aid (sweat equity – contributing to costs with labour) which decreases overall building costs, subsidy from funders, and by all members paying into a shared Relief Fund which helps vulnerable members when they are faced with temporary financial difficulty. By 2017, eight more mutual aid housing cooperatives (13 in total) had formed in the historic centre. The collective effort of the housing cooperatives and the organisations and networks supporting them helped convince the Salvadorian Government to raise €9,000,000 (US$10,043,820), through an agreement with the Government of Italy. This will provide new homes for a further 325 families (1,300 people). This is an outstanding achievement as it demonstrates a commitment from the Government to securing adequate and affordable housing for inner-city residents, paving the way for more people to claim their right to land and safe, secure housing. Mutual aid housing cooperatives involve people working together and supporting each other to provide their own homes. The approach uses ‘sweat equity’, meaning people contribute towards the cost of building their homes with their own labour. Homes are collectively owned by members of the cooperative. Protect families from being forced out of the historic centre by helping them legally access land and ensuring their housing costs are affordable. Improve the homes of families living in poor conditions, ensuring they have access to basic services. Restore the historic centre of San Salvador for the benefit of the whole community. Avoid the need for the expansion of informal settlements outside the city centre. Support the whole community to thrive through a variety of cultural, artistic and educational activities, including people who are often excluded (like women, children, young people, older people or disabled people). Set up mutual aid housing cooperatives across El Salvador that can work together to provide their own housing. Support mutual aid housing cooperatives to influence the Government so they recognise housing as a human right and provide funding and land for housing. 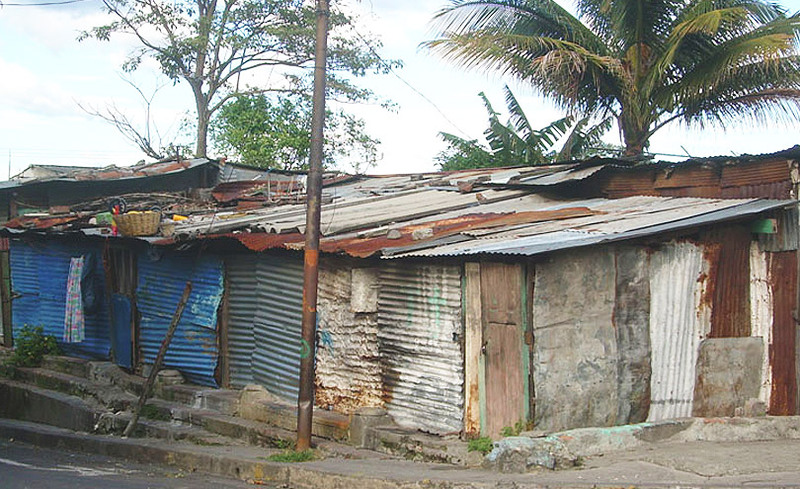 Ensure all the residents of the historic centre of San Salvador are properly and safely housed. Before 2001, the historic centre of San Salvador was in a state of deterioration. 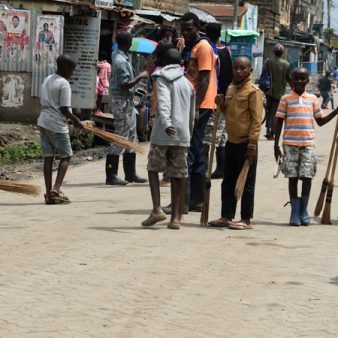 Twenty-nine per cent of the centre’s population was living in informal settlements, characterised by a lack of basic services, overcrowding, a risk of eviction and an unhealthy environment due to poor sanitation and waste disposal. Many of the people living in these conditions were very vulnerable, with high numbers of women and young people on very low incomes. 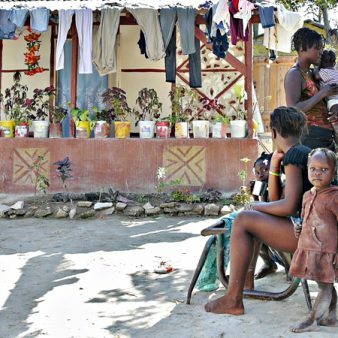 Eighty-four per cent of the families in the informal settlements were living on less than a quarter of minimum wage (US$55 per month – compared to the minimum wage of US$220). Fifty-seven per cent of the women work in informal employment. Local people are enabled to provide themselves with permanent, safe housing through mutual aid housing cooperatives. The most important features of the mutual aid approach in relation to this project are collective ownership and management of housing. All decisions are taken by the members of the housing cooperatives (the people who live or plan to live in the homes). They organise their own committees for designing and building homes, which also creates strong ties between residents as they work together on decision-making. FUNDASAL provides technical advice and helps attract funding for the new housing cooperatives. They carry out training and education programmes and give flexible support to each group. Members of new housing cooperatives share knowledge and encourage others to join their cooperative or create new ones. Within this project, an important aim is the protection and preservation of the historic centre of San Salvador. This has been achieved by accommodating families in high quality high-rise blocks which are designed with the local architectural style in mind, rather than building outside the centre of the city. This new housing replaced the very poor quality shacks they had previously occupied and rented. Work to improve the historic centre has extended to shared spaces such as courtyards and playgrounds, an inner-city orchard, and colourful murals and statues which have revitalised the area. FUCVAM (Uruguayan federation of mutual aid housing cooperatives): Helped to transfer their approach of setting up mutual aid housing cooperatives to San Salvador (this transfer approach won the World Habitat Awards in 2012). FESCOVAM (the Salvadorian federation of mutual aid housing cooperatives): exercise political influence on the Government. San Salvador local government: Sold land to the housing cooperatives at a token price. FPDICHSS (Permanent Forum for the Integral Development of the Historical Centre of San Salvador): An alliance of different organisations and groups working together to protect the historic centre of San Salvador. The cooperatives of San Salvador have been active in this group since 2005. FUNDASAL became a member in 2007. FUNDASAL was one of the founding members, and the cooperatives started being represented in the Forum by FESCOVAM in 2015. 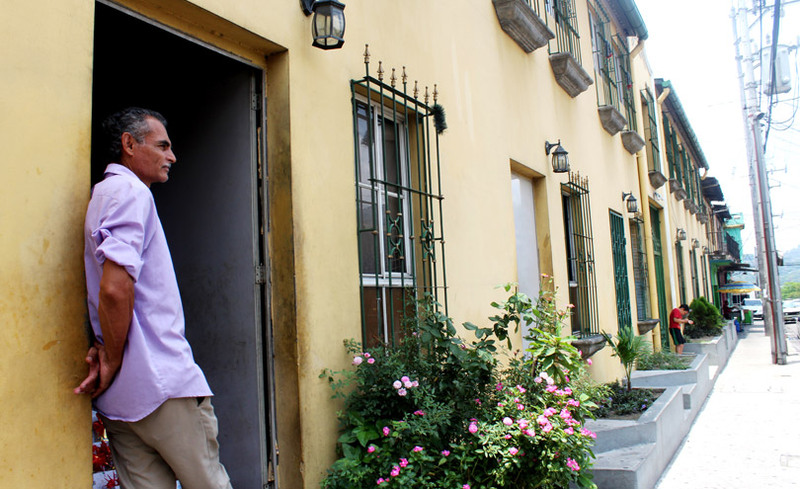 The work to support community-led regeneration in the historic centre of San Salvador has led to safe, secure housing for a growing number of people who were previously living in very poor conditions, at risk of eviction in unsafe buildings. It has helped make the neighbourhood a better place to live in by replacing run-down buildings with new apartment blocks and providing quality public space. Working together and doing activities together like growing their own food, has helped develop closer relationships and supportive networks within the community. Local and national government, civil society organisations and academics have recognised the success of the approach in improving housing and strengthening communities. In 2008 official, legal recognition of the historic city centre of San Salvador from the Government of El Salvador was achieved. They also reformed the law relating to Cooperative Associations, which permitted mutual aid housing cooperatives to be legally recognised. This led to the allocation of public land and funding to the cooperatives so that they could build their new homes. These activities and achievements led to a new National Policy on Housing and Habitat in 2015. The introduction of a new National Law on Housing and Habitat is currently being discussed (in 2017). FUNDASAL and FESCOVAM are also influencing conversations about the application of the New Urban Agenda in El Salvador . The New Urban Agenda is an international commitment by governments and many other participants (including civil society groups, indigenous peoples, local communities the private sector and academic community) to improve the well-being of all citizens in urban areas across the world. CORDAID and MISEREOR (Catholic non-governmental organisations which help people in poverty and distress) provided funding to support FUNDASAL’s research and its work to promote mutual aid housing cooperatives to the government and others. From 2004 to 2007, US$609,360 to train the FUNDASAL Technical Support Team, so they could advise housing cooperatives on financial management and building methods. From 2008 to 2016, US$1,802,029 to set up a Cooperative Training School across Central America (Honduras, Guatemala, Nicaragua, Costa Rica and El Salvador); train cooperatives to grow their own food within the city centre; provide further training for the FUNDASAL Technical Support Team; support specific projects by ACOVIVAMSE and ACOVICHSS (housing cooperatives) such as a community project to paint murals. In 2017, US$292,800 to support further training for the FUNDASAL Technical Support Team. Vastenactie (a Catholic relief organisation based in the Netherlands) provided US$13,113 (2014-2015) to support training of cooperatives to create organic/hydroponic orchards in the centre. Provides technical advice to communities who want to grow their own food within the city. Provides start-up loans to help set up new local businesses and other activities which strengthen the community. AECID (the Spanish Agency for International Development Cooperation) provided a combination of grant and loan funding to ACOVICHSS (Asociación Cooperativa De Vivienda Por Ayuda Mutua Del Centro Histórico De San Salvador), one of the first housing cooperatives to build their new homes through the project. Funding to ACOVICHSS from AECID: US$1,067,064 (2008-2010) for land and construction of two housing complexes. 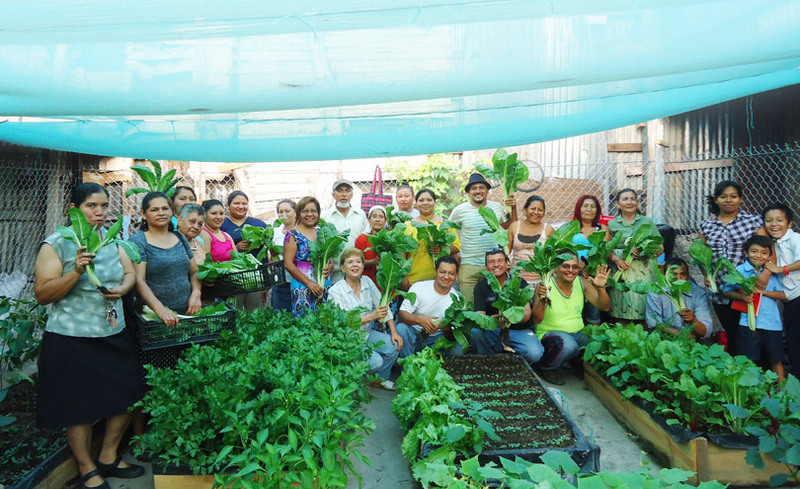 FUNDASAL set up a revolving loan fund to support mutual housing cooperatives, so repayments from one project in El Salvador can be used to fund the next. With the support of KfW (a German government-owned development bank), so far one housing cooperative in San Salvador (ACOVIVAMSE, Asociación Cooperativa de Vivienda por Ayuda Mutua San Esteban) has been partially funded in this way. This approach of recycled funding will continue to support new projects. Repayment of loans by ACOVICHSS (housing cooperative) will be reinvested by AECID (the Spanish Agency for International Development Cooperation). This is made up of two loans to be repaid by the cooperative over 15 years. AECID loan: US$30,016 (granted in 2009) to be repaid over 15 years in instalments of US$300 per month. AECID loan: US$22,512 (granted in 2011) to be repaid over 15 years in instalments of US$225 per month. Repayments by ACOVIVAMSE (housing cooperative). These will go back into the revolving fund set up by FUNDASAL and KfW. Repayments will be returned over 20 years. The loan amount is US$293,747 plus an additional loan of US$2,549, which was granted in 2013. Funding of €9,000,000 (US$10,043,820) contributed by the Government of Italy to the Government of El Salvador which they will use to support new housing cooperatives to continue forming and building new homes in the historic centre of San Salvador (2018-2020). Housing blocks built by the ACOVIVAMSE housing cooperative: US$29,775. Housing blocks built by the ACOVICHSS housing cooperative: US$50,797 (these costs are higher than the above since in this case the government did not fund the access to land). Housing blocks to be funded by the Government of El Salvador (2018-2020) using funds from the Government of Italy: US$27,692. The residents, supported by FUNDASAL and FESCOVAM, have built a strong, independent community, starting with the most vulnerable and excluded. A range of educational and training activities have built the confidence, health and well-being of the residents of the historic centre of San Salvador. The revolving fund FUNDASAL set up with KfW means repayments from one cooperative can help others in the future. The approach of building up instead of out and replacing existing buildings has allowed the community to remain together while protecting the wider area. This has preserved the historic features of the centre of San Salvador, restoring some of its character using designs that complement its original style, and replacing buildings previously damaged by disasters. This work has helped gain legal recognition, funding and support for mutual aid housing cooperatives from the Government of El Salvador. This means a stronger voice for FESCOVAM (the Salvadorian federation of mutual aid housing cooperatives) and its members in discussions about housing policy. The housing cooperatives in the historic centre of San Salvador have replaced existing buildings rather than built new ones outside the centre. This means improved homes can be provided while protecting the wider area from the environmental damage caused by the construction of new buildings. Using land which is already built on also means that existing infrastructure is used. Basic services such as water and sewage systems are more likely to be in place or locally available. Properties are designed around a central courtyard which means natural light and air can be used for lighting and ventilation and the buildings are more resistant to natural disasters. Because the communities are now well organised, this also improves their ability to respond to natural disasters. Cooperatives have started growing food within the city centre using organoponic (organic/hydroponic) orchards. This is a form of urban agriculture which can be replicated. It typically uses low concrete walls filled with organic matter and soil, with lines of drip irrigation laid on the surface. The new buildings include homes and a commercial space on the ground floor, so the housing cooperatives can set up businesses such as workshops or commercial spaces to generate income for the local economy. The orchards set up in the historic centre will also help to provide affordable food for local families. The approach has ensured people living in the housing cooperatives can afford the cost of the new homes by working out maximum housing costs based on member’s capacity to pay. Training of housing cooperative members has helped some of them find employment in construction, providing jobs and financial stability. To guarantee secure housing for community members involved in the project, a funds was set up to cover any shortfalls in housing payments: the Relief Fund use contributions from the cooperative members. While initial funding came from external donor organisations, the new Government funding represents a shift in their attitude. This funding has been committed from 2018 to 2020, and FUNDASAL and FESCOVAM are in conversation (in 2017) with the Salvadorian Government about a new National Law on Housing and Habitat. This work has improved living conditions for some of the city’s poorest residents, who have secured the right to remain within the historic centre and to stay together as a community. The sense of solidarity created through the whole process of developing the newly formed housing cooperatives means people look after each other. This also extends to financial support. For example, if the parents of children living in the cooperatives die, their housing payments will be covered by the other cooperative members (through the Relief Fund) until they are old enough to take over. Cooperatives in San Salvador hold ‘solidarity days’ where they come together to contribute to housing construction their community. In addition, these days also include a shared lunch, which offers a space for socialising and discussing, along with a time for participatory discussions on how to transfer the project’s work, methodologies, and the cooperative model. These activities help strengthen the work of each cooperative, along with personal links between members. They are now active members of their communities and networks at local, national and regional levels fighting for safe, secure and adequate housing for all. Being part of a national network has drawn people from cooperatives all over the country to San Salvador to help. Members of the housing cooperatives have increased confidence and are better able to lead within the community. Seventy per cent are women, many of who previously had few opportunities. Two new schools to train cooperative members (funded by WeEffect) about political engagement and how to run a successful cooperative have been set up to help this continue. New buildings and improvements to public spaces have regenerated the historic centre of San Salvador for the benefit of the whole community. 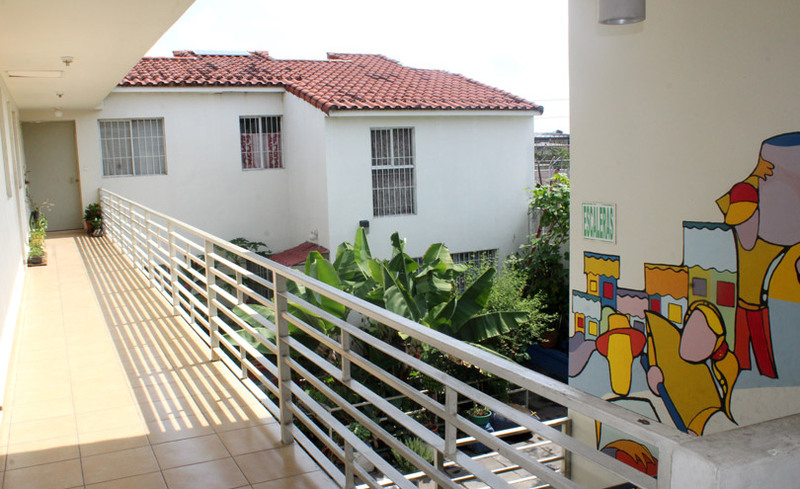 The involvement of the new housing cooperatives in FPDICHSS (the Permanent Forum for the Integral Development of the Historic Centre of San Salvador) has strengthened the ability of the community to work together. They have organised neighbourhood festivals, and carried out improvements to public spaces such as parks and squares. Young people have been encouraged to get involved through activities like football tournaments, mural painting and making statues for the area. A new museum for children, “Tin Marin” has been set up by FUNDASAL to provide access to education and culture for the local and surrounding population. People living in informal settlements in the historic centre had historically been excluded from decision-making in society. Initially this prevented residents from actively participating in the community and often led to conflict or distrust. However, the first housing cooperative members to build improved housing for themselves in San Salvador (ACOVICHSS) demonstrated what was possible and inspired others to take part. Financial support from the government for housing was lacking and there was no appropriate legal framework before 2008. This was overcome by collaborating with FESCOVAM (the Salvadorian federation of mutual housing cooperatives) to convince the Government to make the changes needed and provide land and funding. Reinventing the historic centre has also helped to stir interest in the project and has increased the support for changes in public policies. However, further expansion of this model will be limited if Government support is discontinued in the future or if the ability of people to help themselves is underestimated. The first pieces of land selected by the housing cooperatives for the new phase of the project (to be funded by the Salvadorian Government) did not meet the requirements for development. This was overcome by identifying alternative land so that the building could go ahead. The next cooperatives to build are developing ways in which the Salvadorian government can guarantee land and funding in a more sustainable and secure manner so that more housing can be built in the future. Building upwards and not outwards helps slow down the expansion of urban areas and works as a way of effectively regenerating historic centres. The work of FUCVAM (the Uruguayan Federation of Mutual Aid Housing Cooperatives) to train new mutual aid housing cooperatives in El Salvador shows the approach can be adapted to local contexts, where challenges might differ but keeping the mutual aid model and lobbying the government for adequate legislation and funding remains relevant. Encouraging lots of different people and organisations to work together is an effective way of making a difference to people’s housing conditions. Participation and empowerment of women (numbers in management positions; numbers supporting themselves financially, skills acquired). Number of successful applications for finance and land. Number of people who have received training. Number of social activities that help reinforce housing cooperatives. Internal evaluations are carried out by the housing cooperatives themselves, in addition to independent external evaluations organised by FUNDASAL. Women have been empowered to participate and increase leadership through the project. 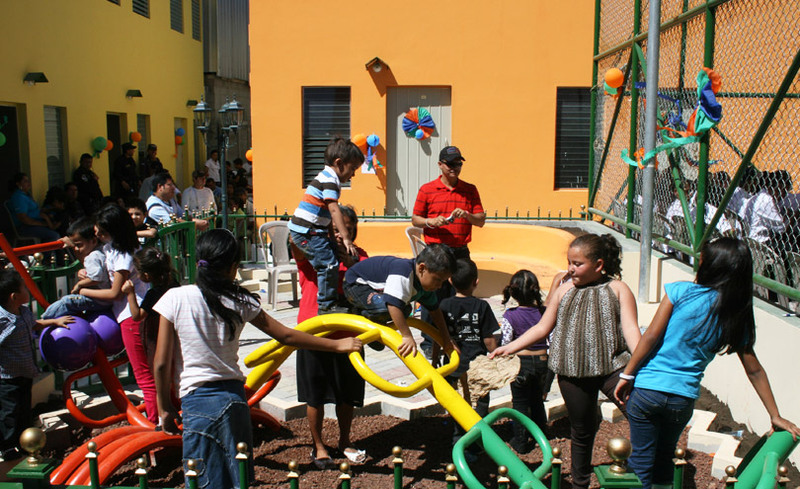 The work has resulted in safe, secure and affordable housing for inhabitants of the historic centre of San Salvador who were living in very poor conditions. The project has strengthened the confidence of the housing cooperative members to work together to take control of their own housing. Because those involved in the project gained confidence in expressing their views regarding policies, this helped achieve their legal recognition from the Salvadorian Government, helping to secure the housing rights of its citizens. The regeneration of the historic centre of San Salvador has received two prizes for best practice and obtained significant media attention. 2008 – National Urbanism Prize (given by the Vice Ministry of Housing and Urban Development) and the International Best Practices Prize (awarded by the Swedish Co-operative Centre – now WeEffect). Twenty-five articles covering the project in newspapers. Several TV and radio interviews. As a direct outcome of this programme there are now 13 mutual aid housing cooperatives in the historic centre of San Salvador. The work has inspired others, and FUNDASAL are sharing their experience to help transfer the approach. This is happening in other historic centres in El Salvador, like Suchitoto in Cuscatlán, and Zacatecoluca in La Paz – where a flexible financial model is currently being set up. The local government in Los Nonualcos is working to promote housing rights and has produced a plan to regenerate its own historic centres. The two training centres (focusing on political engagement and cooperative development) set up through the project will strengthen the knowledge and capacity of housing cooperatives in the region. Involvement of the housing cooperatives from El Salvador with COCEAVIS (a network for mutual aid housing cooperatives in Central America) is helping to share and transfer knowledge and practice regarding different mutual housing models, including as a tool for rehabilitation of historic centres. 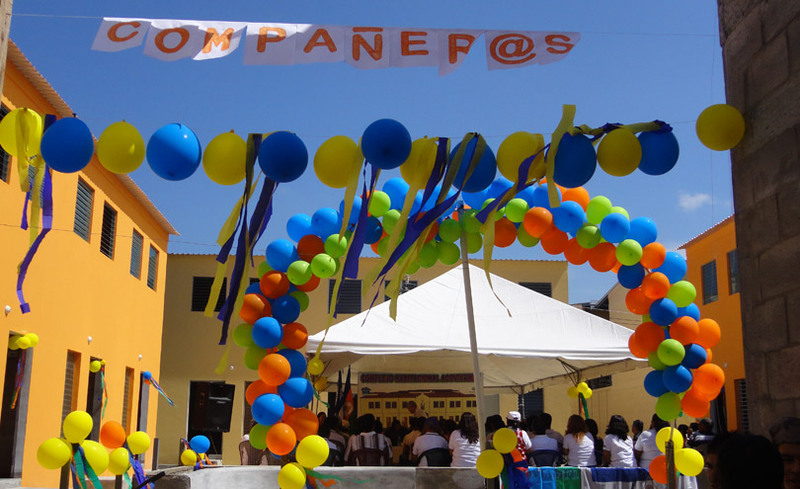 And through this network, FUNDASAL has helped provide technical assistance when setting up 65 new mutual aid housing cooperatives across Central America; in Nicaragua, Guatemala, Honduras, Costa Rica and Mexico and has included lessons from this project. They are also exchanging experiences with organisations working to regenerate Hebron, Palestine. In addition, FUNDASAL is providing funding to housing cooperatives to buy land in Guatemala and Nicaragua. The regeneration of the historic centre of San Salvador has influenced the Salvadorian Government to continue to support and invest in new mutual aid housing cooperatives. This is set out in official policy documents, including their five-year development plan for 2014 – 2019. Laura Margarita Molina is the youngest daughter of six children born and raised in the centre of San Salvador. 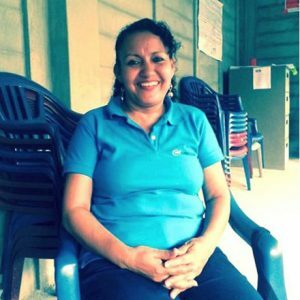 She has been a member of the ACOV-UVD cooperative since 2008 and currently lives in her brother’s house with her 21-year-old daughter. She works as a cleaner and sells school supplies from home, but dreams of owning a bookstore. Being part of the cooperative has given me strength, a new family and a sense of belonging. It helps keep me busy and I can spend my time doing something productive. It has helped me learn to save and think about the future. I have made good friends who help me a lot. Each meeting is a learning process and can be a challenge, but we have good relationships. I help out with the community orchard, which has been started up within our cooperative. I come to the gardens on Thursdays and I love tending to the plants. I know what each one is for, some we use for cooking and others are medicinal. We sell the plants to members of the community, families from the cooperatives and people who come to visit. I hope that when we get the land for our homes, there will be spaces to live together, to talk and to meet, a place where children can play. I will continue to attend marches to try to influence politics and the media, to fight for decent, fair and adequate housing for people still living in shacks in the historic centre of the city. If you want something you have to fight for it.